Pretty in Pink, Pleats and Prada | Just Jess Fashion! So it’s no secret my favorite color is pink. Specifically Barbie pink. I actually went through a phase in life where every single day I wore pink from head to toe. I had it all. Pink back pack, pink folder, pink accessories, pink pants, pink shoes, well you get the picture. I think I was trying to make up to myself for the time I lost during the two years in middle school I claimed my favorite color was lime green. It was Nick Carter of the Backstreet Boy’s favorite color and I believed with all my heart that by denouncing pink in the name of lime green I was literally telling the universe Nick Carter was my soul mate. Shocker it didn’t work out between me and Nick. Alas, he is taken, by a girl whose favorite color is no doubt lime green. She lifts too. Whatever. Anyways, even in college I had a professor tell me she appreciated the fact that every time she saw me I was wearing pink. Who knew the guilt trip of my middle school lime green years would follow me for a life time! Sometimes looking at your nails or that perfect shade of pink lipstick is the perfect pick me up I need to get me through the days woes. Truth be told though my obsession with pink is not entirely Nick Carter’s fault. As a matter of fact, I’m pretty sure I’ve been in love with the color since the day I was born. And that love has led to the appreciation and fondness of equally bright, and vibrant colors. My boss told me the other day he picked a folder comprised of yellows and oranges specifically for me. “Sweet!” I responded to this announcement and explained why I appreciate bright happy shades of the color wheel. Life after all, is too short to not appreciate a pop of color whether it be in the office, painted on my nails (which I’m proud to announce are not only currently pink but sparkly as well!) or even a fabulous skirt such as this little H&M gem. Don’t get me wrong, I too have my dark days. Where I wear black on black, and even a plumb shade of lipstick. I envision my mother rolling over in her grave every time I wear a dark shade. After all she prohibited me from wearing black, shopping at Hot Topic and wearing anything other than borderline sheer lip shades. But life, no matter how tragic I might think the day is, is still to short not to wear the happiest color on as many days as possible. 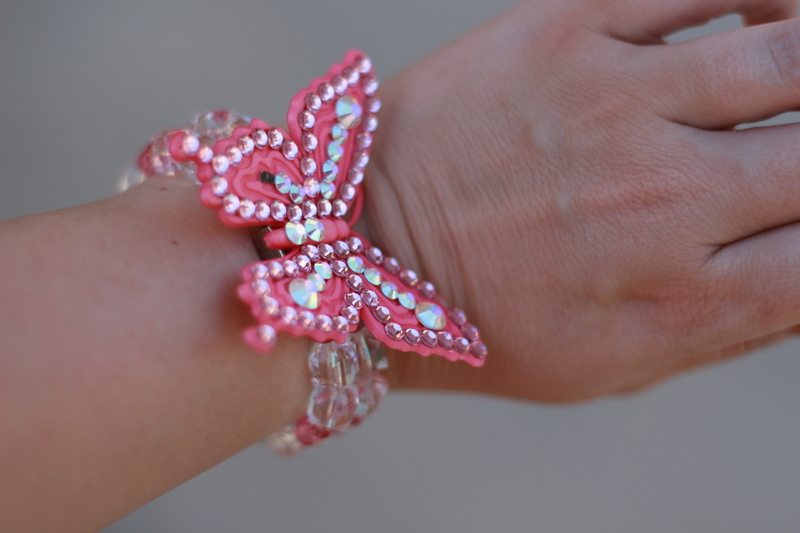 One of the most tragic days of my fashion lives was when my sisters (no one came forward so in my opinion they’re both guilty) took the matching ring to this bracelet, removed the butterfly from the ring portion and glued it to a hair tie. Seriously? Who does that?! I love your pink attire and I am sure that your mom would forgive a seldom worn black day for you as the colors truly outweigh the black. And whichever sister glued the beautiful butterfly onto a hair rubber band, boy oh boy, I have sisters too and totally understand even if I do love those girls as much as you! But I do love that bracelet! So so cute and looks so brilliant with that outfit!! Good job! I love this outfit and the shoes! !